Relax on this island paradise, featuring rural landscapes, charming villages, pristine beaches and a laid-back local atmosphere. Gozo is the second-biggest island in the Maltese archipelago and is known for its tranquil beaches, rolling green hills and historical and natural wonders. The island is known as “The Island of Calypso” for its connection with the mythical island of Ogygia, the home of Calypso in Homer’s Ancient Greek Odyssey. The serene and picturesque island is rich with tradition, history and legends. Visitors and locals alike savor the island’s relaxed pace and beautiful beaches. Visit Gozo’s remarkable natural phenomenon, the Azure Window. This immense stone arch formed naturally after the collapse of limestone caves millions of years ago. Have a swim at one of Gozo’s secluded beaches or join the lively beach atmosphere of Marsalforn Beach and Xlendi Bay. Discover the thriving aquatic life during a scuba dive in the sparkling Mediterranean or explore the azure depths during an inland sea dive along a deep canyon and its shadowy tunnels. The island is less developed than mainland Malta, with much of its fertile land dedicated to farming tomatoes, grapes, figs and oranges. Local handcrafts include lace, pottery, palm weaving and cane work. Gozo is dotted with churches and church bells chime daily all over the island. Visit the charming Basilica of the Blessed Virgin of Ta’ Pinu, which looks out from the cliffs on the north of the island. An inexpensive ferry service crosses the Gozo Channel between Mgarr on Gozo and Cirkewwa on the northwestern coast of Malta frequently year-round. The trip takes approximately 25 minutes. Plenty of hop-on, hop-off buses service the island, as well as a range of public buses, taxis and rental cars. Take a break from lounging on the beach and walk from village to village. Use a map, wear sturdy walking shoes and enjoy a slower-paced way to see the sights on Gozo. The distance between villages ranges from 1-3 miles (2-5 kilometers), so bring plenty of drinking water and snacks for on the road. 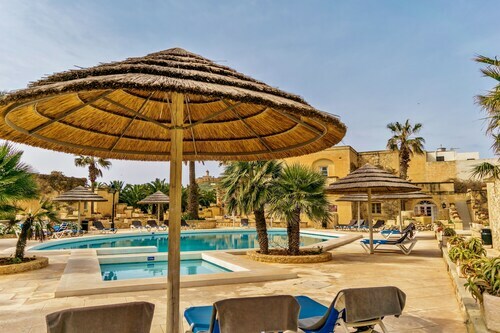 This family-friendly Kercem hotel is located in a rural location, within a 15-minute walk of Ta' Dbiegi Crafts Village and Gharb Folklore Museum. Ta' Pinu Shrine is 1.2 mi (1.9 km) away. 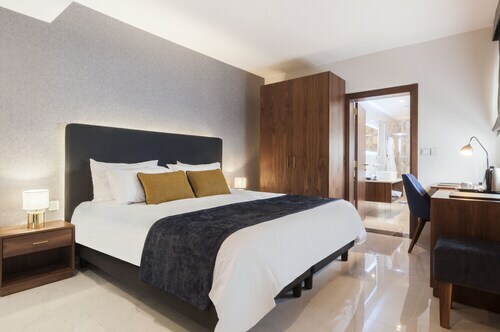 Situated near the beach, this hotel is 0.4 mi (0.6 km) from The Citadel and 1.8 mi (2.8 km) from Ggantija Temple. Belvedere and Windmills are also within 6 mi (10 km). 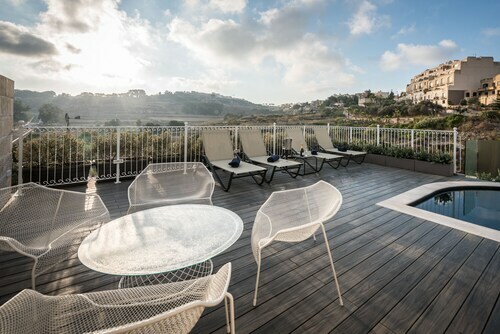 Situated by the sea, this spa hotel is within a 10-minute walk of Belvedere and Gozo Ferry Terminal. Windmills and Mgarr ix-Xini are also within 3 mi (5 km). 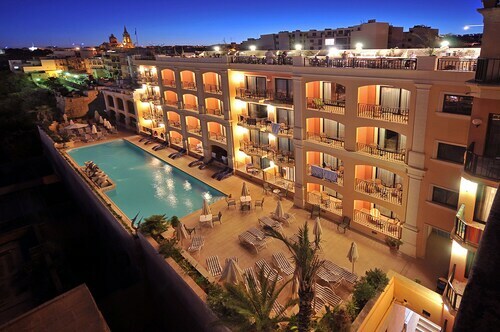 This family-friendly Sannat hotel is located by the sea, within 2 mi (3 km) of Ta' Cenc and Mgarr ix-Xini. St. George's Basilica and The Citadel are also within 3 mi (5 km). Situated by the sea, this guesthouse is within a 5-minute walk of Marsalforn Bay and Marsalforn Beach. Ta' Mena Estate and Ta'Kola Windmill are also within 3 mi (5 km). 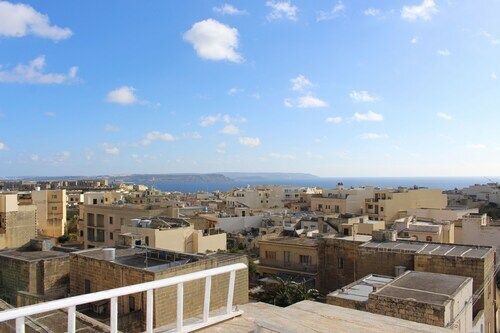 Situated in Xlendi, this property is within 2 mi (3 km) of Sanap Cliffs, Lunzjata Valley, and Il Hagar - Heart of Gozo Museum. St. George's Basilica and The Citadel are also within 2 mi (3 km). 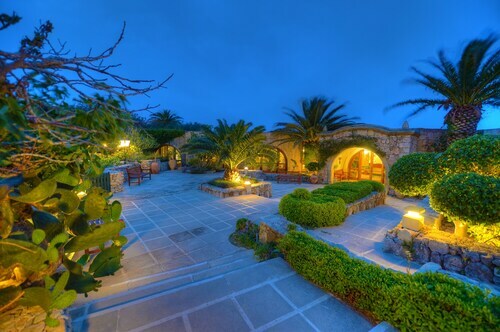 Located in the heart of Ghajnsielem, this guesthouse is 0.8 mi (1.3 km) from Belvedere and 2.8 mi (4.5 km) from Blue Lagoon. Gozo Ferry Terminal and Mgarr ix-Xini are also within 2 mi (3 km). 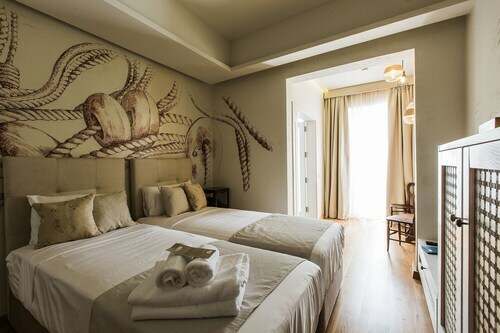 This family-friendly Ghasri aparthotel is located in a rural location, within 2 mi (3 km) of Ta' Pinu Shrine, Ta' Dbiegi Crafts Village, and Gharb Folklore Museum. Wied il-Mielaħ Window and The Citadel are also within 3 mi (5 km).